Private Gordon Reid was the son of John & Elizabeth Reid, Cookstown. Gordon was a member of 7th Battalion Parachute Regiment, 5th Parachute Brigade, 6th Airborne. Gordon parachuted into France again on the 6th June 1944. Their objective was to secure the Eastern flanks of the British landings and to secure the village of Benoville and subsequently the area around Ranville. The 6th Airborne spent the next 2 months consolidating their position in this area. 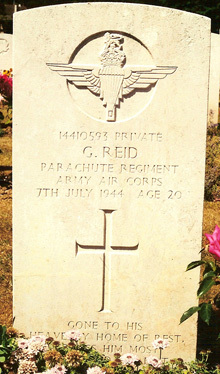 Gordon Reid was killed on 7th July 1944.